1 What is Diabetes Disease? 2.4 What are the complications associated with diabetes? Have you noticed any uneasiness or fatigue in your routine? Diabetes might be the reason. Diabetes Disease may affect anyone of any age. In fact, the Diabetic Patients has dramatically increased with time. It is one of the leading causes of blindness, stroke, heart attack, kidney failure, and lower-limb amputation. American Diabetes Association and WHO has estimated that by 2030, the number of diabetic patients will increase more than double and will become the 7th leading cause of death. Thus, this lifestyle disease has become a major topic of concern. Living with it not only affects a person physically and emotionally, but it also creates a financial burden on a family. Also Read: How to gain weight naturally? Diabetes Mellitus is Type one Diabetes Disease. The other one is Type 2 Diabetes. Diabetes insipidus (DI) is a condition in which the patient undergo excessive thirst and excrete large amounts of severely diluted urine. The reduction of fluid intake has no effect on the concentration of the urine. Our intention is to provide a complete knowledge of Diabetes Mellitus, Diabetes Insipidus. It helps the people living with this disease to improve their quality of living and provide them psychological support. Diabetes Disease is a chronic metabolic disorder that is characterized by the complete inability or decreased the ability of the tissues to utilize carbohydrates. It occurs due to either deficiency or diminished effectiveness of the insulin hormone. Thus, it may be defined as a group of diseases affecting the body’s ability to utilize glucose (sugar) resulting in high blood sugar levels. We all know that every cell of the body needs the energy to perform the necessary functions and glucose is a vital source of energy. In fact, our brain cells derive energy from glucose. Therefore, for a healthy body glucose is very vital. Hormone Insulin plays a very crucial role in distributing glucose throughout the body. Also, it moves the excess of glucose to the liver to be stored. But if you have this lifestyle disease due to the deficiency of decreased efficiency of the insulin, movement of the glucose is affected. It increases the level of glucose in the blood, causing the cells to starve. Slow-healing of wound and sores. 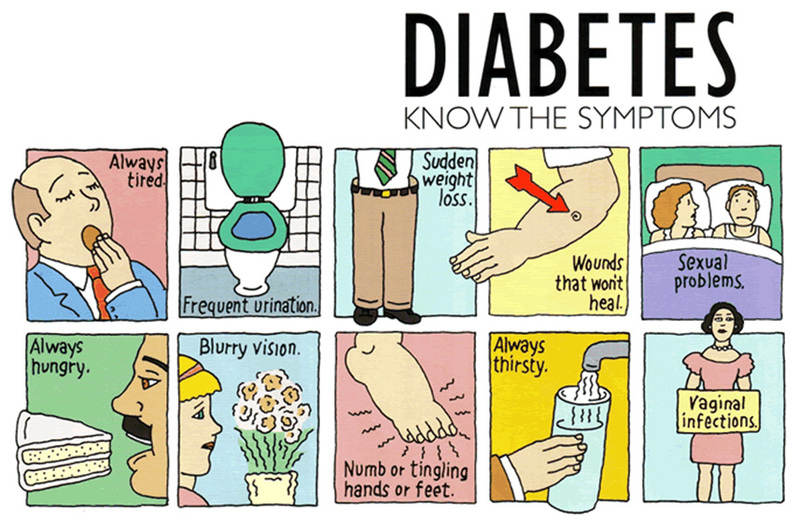 These are the Signs and Symptoms of Diabetes. In the case of diabetes type 2 and pre-diabetes, these symptoms may not be experienced during the initial stages. But, In the case of type-2 diabetes, these symptoms are more severe and appears quickly. Early Signs of Diabetes is nothing but the Prediabetes Symptoms. Also, know the causes of Diabetes Types. Gestational Diabetes Symptoms appear only when the Pregnant Women gain more weight. Symptoms of Gestational Diabetes are frequent urination and overweight. By following Gestational Diabetes, Diet will control the Diabetes Disease. Diabetes is of several types such as type 1, type 2 diabetes, gestational diabetes, and Prediabetes. Gestational diabetes Disease appears during the pregnancy and usually goes on its own after delivery. So, It affects about 2 to 10 percent of pregnant women. Women who have Pregnancy diabetes are at 35 to 60 percent risk of developing diabetes within 20 years. It may also lead to pre-eclampsia and a big baby. Pre-diabetes is a stage where the person’s blood shows a high level of glucose, but not so high to qualify as diabetes. Individuals suffering from this type are under the risk of developing type 2 diabetes. The two main types of diabetes we need to concentrate and will discuss briefly in this article is type 1 and type 2 diabetes. There are few differences between Type 1 and Type 2 diabetes. Come, Let us learn what they are? Also, there is no Type 3 Diabetes. This Diabetes is also known as insulin-dependent diabetes. Type one Diabetes is a condition where the body stops the production of insulin. It causes an increase in the level of blood sugar. It is an autoimmune disease where the islet beta cells in the pancreas that produces insulin are attacked by the body’s immune system by producing antibodies against them. This type of diabetes begins in early childhood but may occur in adults after an age of 30 to 40years. As the body of the individuals who have this type of diabetes is unable to produce insulin, they require injected doses of insulin. Also, it is very important for them to match the dose of insulin being injected with the diet they are taking. Type-1 diabetes treatment may also include replacement of the damaged pancreas and promoting the function of the pancreas. There is no Type 1 Diabetes Cure. Just use the Medicines properly. 2. Introducing certain foods to the infants, such as fruit juices very early (before five months). Introducing rice and oats before seven months of age may also act as a trigger. 3. Exposure to certain toxic and chemicals such as endocrine receptors found in the plastics. 4. The family history of type 1 diabetes also increases the risk of developing it. Early exposure to cow’s milk and cereals before the completion of 4 months of age. Prenatal exposure if the mother has pre-eclampsia or metabolic syndrome. The rates of type-1 diabetes are comparatively higher in Finland and Sweden. What are Type-1 Diabetes symptoms? 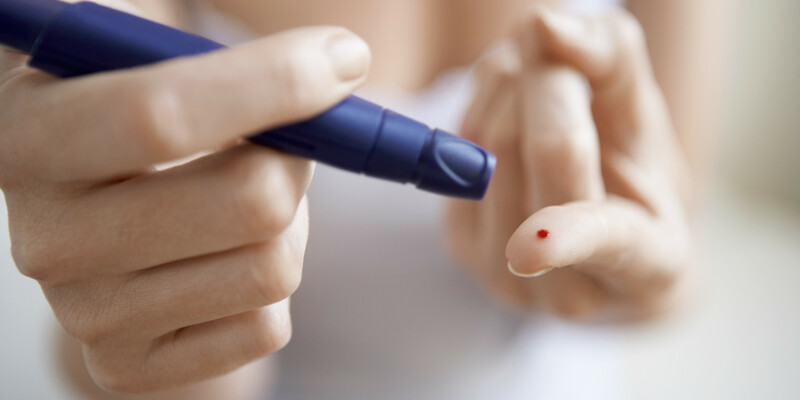 Besides the above mentioned common symptoms of diabetes patients with type-1 diabetes may also experience pain in stomach, diarrhea, swelling of the ankles, hair loss, night sweats, blurred vision, weakness and high breath. It is crucial to diagnose type-1 diabetes in time, or it may lead to a life-threatening complication known as ketoacidosis. It is one of the most common types of Diabetes. 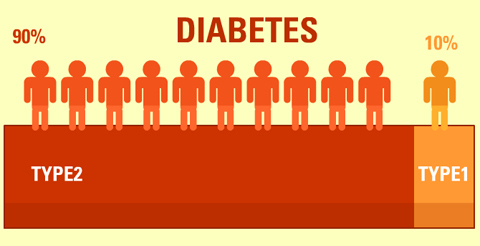 Type 2 Diabetes may affect people of any age but is more common in people above 40 years of age and obese people. It is also known as non-insulin dependent diabetes mellitus. It is a condition where the cells are unable to utilize blood glucose efficiently to produce energy. Thus, the insulin produced in the type-2 diabetes by the pancreas is normal or high but is not as effective as normal insulin. It causes the level of blood sugar to rise too high and over the time the cells become insensitive to the insulin. As the cells become resistant to insulin, the insulin requirement to move the glucose also increases. But with the time the pancreas fails to fulfill rising demand for insulin and the level of blood sugar in the blood increases. Type-2 of diabetes is comparatively easy to manage by following a proper diet, exercise regime, and oral anti-diabetic medications. No Type 2 Diabetes Treatment. Medication is the only way to control it. Diet for diabetics will also help as a Treatment. 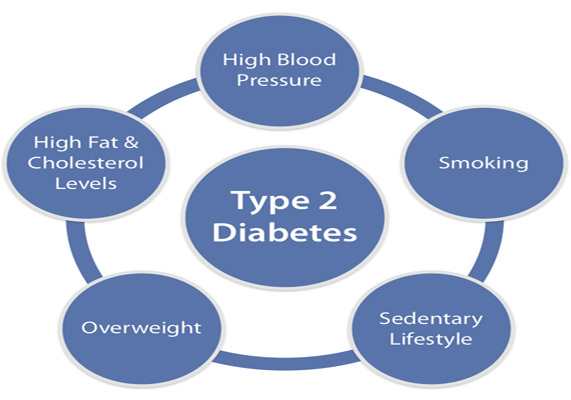 What are the causes of type-2 diabetes? Excessive intake of artificial sweeteners processed foods and refined sugars. The family history of diabetes. Women with polycystic ovarian syndrome are at risk to develop of developing type two diabetes. Other metabolic disorders such as hypertension, high triglycerides, and low HDL. Prediabetes and gestational diabetes also increase the risk of developing type ii diabetes in the future. The symptoms of type -2 diabetes have a gradual onset. Besides the common symptoms of diabetes Type 2 or diabetes mellitus, it may also result in obesity. But many patients may lose weight unintentionally. 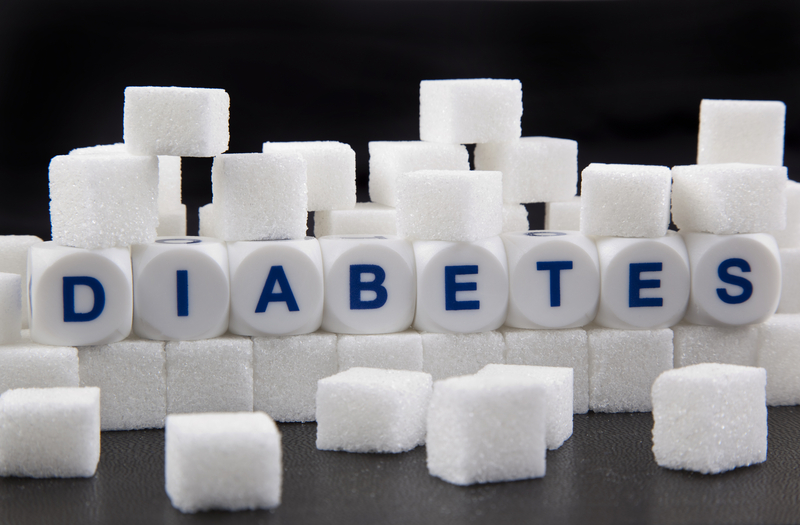 This type of diabetes has recently been categorized under a separate entity. It is seen mostly in tropical countries like India and affects people between 15 to 30 years of age. It makes the sufferer look lean and malnourished. In this type of diabetes, the pancreas fails to produce adequate insulin. Thus, the patient requires insulin injections. But unlike type-1 diabetes, if insulin injections are discontinued, the patient does not develop ketoacidosis. If the level of the glucose in the blood rises too high, it may cause serious complications that may prove to be fatal. This condition is also known as insulin shock and may occur in the patients who have type-1 diabetes. It is caused due to insulin overdose or not eating after taking the insulin dose. Also loss of food due to vomiting, exercising and diarrhea may lead to hypoglycemia. This condition is characterized by sweating, dizziness, headache, mental confusions, uncoordinated movements, emotional instability, weakness, palpitation sand even fainting. Children may develop lassitude, convulsions, muscle twitching or even a comma. It is again a complication of type-1 diabetes that develops in the case of consuming foods for which insulin dose may not be sufficient. Also, stress or acute infection may cause glucose intolerance and results into ketoacidosis. This condition makes the patient weak, ill and suffers from anorexia, headache, nausea, vomiting, dehydration and pain in the abdomen. Also, the skin and mouth become dry; breath becomes foul, blood pressure decreases, the pulse becomes rapid, and the patient may pass into a comma. Uncontrolled diabetes may lead to vascular diseases such as coronary artery disease, angina, atherosclerosis, heart attack, and stroke. These are the life-threatening conditions that may even result in the death of the patient. Uncontrolled diabetes may lead to vascular diseases such as coronary artery disease, angina, atherosclerosis, heart attack, and stroke. These are the life-threatening conditions that may even lead to the death of the patient. Excess of sugar may diminish the transmission of the nerve impulses and also cause damage to the nerves that affects the function of the muscles and sensory perceptions. Also, uncontrolled diabetes causes injury to the blood capillaries that supply the nourishment to the nerves. It mainly affects the Nerves of legs. It causes numbness, tingling and burning, diabetic nerve pain, tenderness of the muscles and paresthesia. These symptoms begin at the tips of the fingers and toes and slowly moves to the upper parts. If we neglect this condition, it may cause loss of sensation of the affected limbs. In involves the nerves of digestion, it results in vomiting, diarrhea, nausea, and constipation. In men, this condition may lead to erectile dysfunction. The millions of clusters of tiny blood vessels known as glomeruli present in the kidney filter the waste from the blood. The excess of sugar in the blood may damage this natural filtering mechanism of the body. These changes also lead to proteinuria and uremia. If the harm caused is severe it is irreversible and leads to kidney failure. Such patient has only two options left, and they are dialysis and kidney transplant. The damage to the blood vessels of the retina due to the increased level of blood sugar may cause potential harm. It leads to cataract, glaucoma, and even blindness. A fasting plasma glucose Diabetes test- It measures the level of blood glucose after a fast of at least 8 hours. This Test will detect prediabetes or diabetes. If the fasting blood sugar level is below 100mg/dL, it comes under normal Condition. If it is between 100mg/dL to 125mg/dL consider it as prediabetes and above it indicates diabetes. An oral glucose tolerance test- It measures the level of blood sugar after you haven’t eaten anything for eight hours. And the patient should consume a glucose-containing beverage 2 hours before the test. Again, it is to diagnose prediabetes or diabetes. Random Plasma Glucose Test- Here they Test the blood sugar without any regard to the time of your last meal. It is just to diagnose diabetes and not prediabetes. Glycated hemoglobin test- It indicated the average level of blood sugar for the past 2 to 3 months. The management of diabetes includes monitoring of the blood sugar level, blood insulin level, certain Diabetes medications, diet and lifestyle modification. The Diabetes Treatment of varies according to its type. Individuals who have type-1 diabetes need insulin therapy. 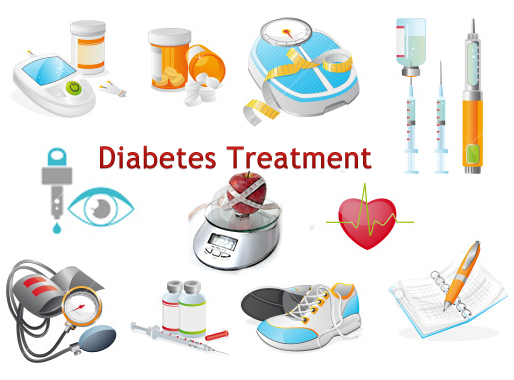 But also in some of the cases of type-2 diabetes and gestational diabetes, insulin therapy may be given according to the patient’s condition and blood glucose level. Oral medication is usually necessary in the case of type-2 and gestational diabetes. Some patients who have type-1 diabetes may require pancreas transplantation. If pancreas transplantation is successful patient may not need insulin therapy, but the success rate is low and patient may need lifetime immune -suppressing medications. These medicines have lots of side effects. Thus, Pancreas transplantation takes place only in particular cases where diabetes doesn’t control or in the case of a kidney transplant. There is no specific Diabetic diet plan, but our Diabetes Diet Plan should concentrate mostly on whole grains, fruits, and vegetables that are low in glycemic index. Better cut down refined sugars, sweets, and animal products. The important part is to understand how much you should eat. The diet plan of the diabetic patient depends on the age, weight, height, exercise, gender and the type of diabetes. The distribution of fats, carbohydrates and proteins should be in such a way that it maintains the level of blood glucose. You can take the help of a registered dietician for this purpose. Better avoid honey, potatoes, yam, mangoes, grapes, banana, chocolates, candies, alcohol, and fried foods. Apart from following this diet also pay attention your physical activity and exercise regularly. Diabetic Desserts, Snacks for Diabetics, and Diabetic recipes will also help sometimes. How to prevent Diabetes Disease? Diabetes Disease cannot be prevented if it is Hereditary. Maximum People attain this disease because of the Genes they acquire from their Parents. But maintaining, perfect Diabetic meal Plan will keep the Diabetes Disease in Control. There are Different Diet plans for both the types. They are Type 1 Diet Plan, Type 2 Diet Plan, and Pre-diabetic Diet or Prediabetes Diet. So, better know them clearly and follow them for good results. Therefore, follow some Regular Exercise and Medication along with Poper Diet Plan. Hope this article helps the diabetic Patients to know what type of Disease they are they have? and also about the Blood Sugar levels too. So, Take care of your body, it’s the only place you have to live in.